Published on December 11, 2007	in Maltese Herald - 2007. 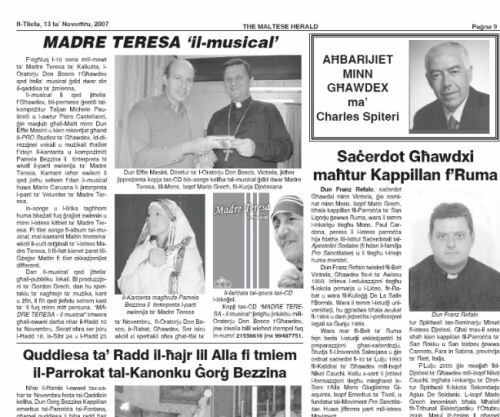 Fil-ħarga tal-gażżetta The Maltese Herald tal-11 ta’ Diċembru il-ġurnalist Għawdxi Charles Spiteri jirraporta dwar iċ-ċelebrazzjoni Djoċesana ta’ Kristu Re li saret il-Ħadd 25 ta’ Novembru ġewwa r-Rabat, Għawdex. 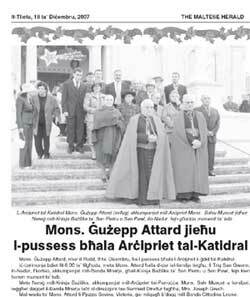 Published on December 5, 2007	in Maltese Herald - 2007. The Maltese Herald hija l-unika gazzetta Awstraljana li tinkiteb bil-Malti. Fost l-artikli f’dan il-ġurnal insibu paġna dwar Għawdex miktuba mill-ġurnalist Għawdxi Charles Spiteri. Fil-ħarġa ta’ l-4 ta’ Diċembru nsibu rapport fuq ir-Rit ta’ l-Ammissjoni ta’ erba’ seminaristi Għawdxin. Iċ-ċelebrazzjoni, li tmexxiet minn Mons Isqof Mario Grech, saret fil-knisja arċipretali tal-Madonna ta’ Loreto, Għajnsielem. Published on November 20, 2007	in Maltese Herald - 2007. Published on November 16, 2007	in Maltese Herald - 2007.